Thinking about applying for the Dallas Cultural Plan 2018 Micro-Residency? Have some questions about the application or what the residency will be? Join us for a Q & A session on Facebook Live Wednesday, December 20th from 1:30 to 2:30 PM CST. As part of the Dallas Cultural Plan 2018, we are inviting all emerging and established Dallas-based artists, arts educators, and designers to submit applications for a paid, week-long, micro-residency within a department of the City of Dallas. 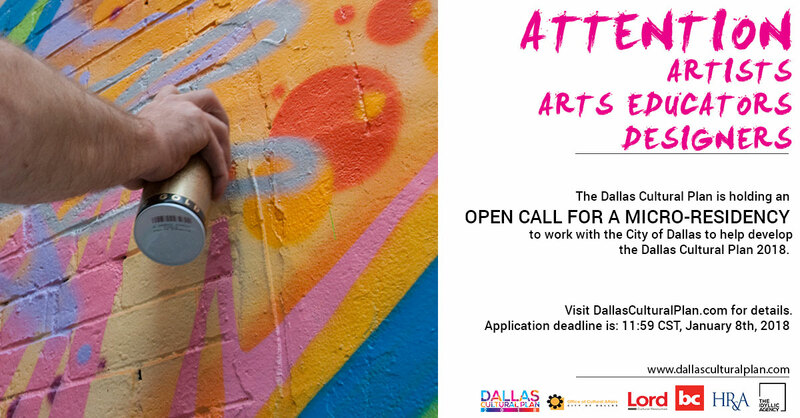 Applicants should demonstrate a connection to the culture and city of Dallas, as well as a strong interest in contributing to the strengthening of Dallas’s arts ecosystem.